I recently came across the wonderful YouTube Channel of Jodi Ann Tolman. Jodi plays very fluidly on her Thormahlen Serenade harp and always gives a lovely presentation in her videos. 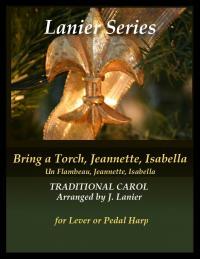 Here she is playing my arrangement of Bring a Torch, Jeannette, Isabella. Thank you so much Jodi for allowing me to add your videos to my website!